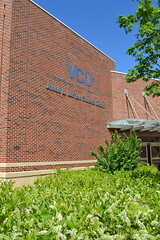 Jonah's is located in the Jonah L. Larrick Student Center on the Medical College of Virginia Campus. The cafe style restaurant features eight food stations, which offer a variety of nutritious food options, including daily specials. The location offers made-to-order meals, fresh bakery items and plenty of grab-and-go meal options. Jonah’s serves breakfast, lunch, dinner and snacks to patrons, and has fully-prepared family meal options for busy professionals who want a well-balanced home-cooked meal for their family or team. This location is outfitted with state-of-the-art equipment, and the flexibility of the design allows for a variety of cooking techniques and meals. Nutritional information is readily available on the Dining Services website and at the nutrition kiosk in the store. Jonah's is a certified Virginia Green restaurant.